Sporting Clube de Goa continued their slow but steady progress in the I-League with a solitary goal victory over Dempo Sports Club at Duler Stadium, Goa, on Saturday. 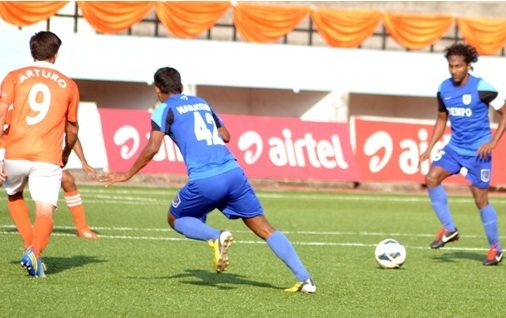 Boima Karpeh scored a 48th minute penalty to propel his side to the second spot with 21 points, the same as Pune FC. It was a tight and nervy contest but one that Sporting Clube always looked comfortable. With Spanish defender Gonzalo Neila in fine form at the back, and Arturo Garcia, his Spanish teammate playing just in front of him, Sporting had an assured look at the back. Dempo were forced to start with just one foreign player, and even Brazilian midfielder Roberto Mendes da Silva had to be replaced because of inadequate form. Coach Mauricio Afonso, deputising for Arthur Papas who is away in Australia due to personal reasons, sent in Gabriel Fernandes for the last half an hour, but nothing worked. After a goalless first half, Sporting Clube took an unexpected lead after the change of ends. Arturo showed good application of mind to take a quick throw-in that Pratesh Shirodkar collected and his resultant cross, quite unfortunately, hit Debabrata Roy, prompting the referee to point at the spot. Boima Karpeh stepped up and although Dempo goalkeeper Laxmikant Kattymani had judged correctly, he could do nothing to stop Karpeh’s powerful strike. At the other end, Dempo never really threatened. Their sporadic attempts lacked firepower to trouble the rival goalkeeper. Second ODI: Can the tide turn in India's favour in Durban?